General note: Dates given here are in the Julian calendar. They are not in the proleptic Gregorian calendar. 1. Abdicated in favor of his son, and was granted the title Taishang Huang (太上皇). Was demoted to the rank of commoner by the Jin on March 20, 1127. Emperor Huizong (November 2, 1082 – June 4, 1135; r. 1100-1126) was the eighth and one of the most famous emperors of the Song Dynasty of China. Huizong was artistic and extremely talented. He wrote poems of his own, was known as an avid painter, created his own calligraphy style, played the guqin, had interests in architecture and garden design, and even wrote treatises on medicine and Daoism. He was a collector of paintings, calligraphies, and antiques of previous Chinese eras, acquiring large collections of each for his amusement. He personally supervised the production of fine porcelain and the training of court artists. Huizong was famed for his promotion of Taoism, and was one of the three Chinese emperors to prohibit Buddhism. Involved with other pursuits, Huizong neglected the army, so the Song China became increasingly weak and at the mercy of foreign enemies. They were unable to defend themselves against the incursions of the Jurchen, and in January 1127, known as the Jingkang Incident, the Jin entered the capital of Bianliang (Kaifeng), and took Huizong, his son Emperor Qinzong, and the entire imperial court and harem captive. Huizong was deported to northern Manchuria, where he spent the last eight years of his life as a captive and died in miserable circumstances. Today, his works of art are on display in museums and collections all over the world; his painting, Peaches, Bamboo and Oriole, sold for RMB 61.16 million (US$ 7.33 million) at the China Guardian 2005 Spring Auction. Emperor Huizong, the eighth and one of the most famous emperors of the Song Dynasty of China, was born Zhao Ji on November 2, 1082, the eleventh son of Emperor Shenzong. In February 1100, his older half-brother Emperor Zhezong (哲宗) died childless, and Huizong succeeded him the next day as emperor. He reigned from 1100 to 1126. 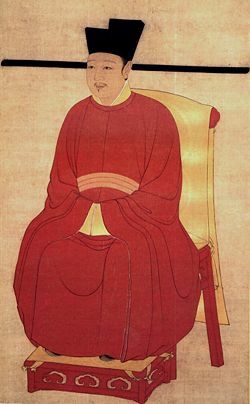 Huizong, besides partaking in state affairs that favored the reformers and conservatives in the Reformist party), was a cultured leader who spent much of his time admiring the arts. He was a collector of paintings, calligraphies, and antiques of previous Chinese eras, acquiring large collections of each for his amusement. He wrote poems of his own, was known as an avid painter, created his own calligraphy style, had interests in architecture and garden design, and even wrote treatises on medicine and Daoism. He assembled an entourage of court painters who were first subjected to an examination to qualify as official artists of the court, and made reforms to the music that was played at court. Like many learned men of his age, he was a polymath. During Huizong’s reign, the greatly enlarged scholar-official class was deeply divided by factional strife, and was unable to agree on foreign policy or on how to deal with China’s aggressive neighbors to the north. Involved with other pursuits, Huizong neglected the army, and Song China became increasingly weak and at the mercy of foreign enemies. When the Jurchen of Manchuria founded the Jin Dynasty (1115–1234) and attacked the Liao kingdom to the north of the Song empire, the Song court allied with the Jin and attacked the Liao from the south. They succeeded in destroying the Liao kingdom, a long-time enemy of the Song, but this victory left an even more formidable threat, the Jin, on the northern border. Not content with the annexation of the Liao kingdom, and correctly appraising the weakness of the Song empire, the Jin soon declared war on their former ally, and by the beginning of 1126, they had crossed the Yellow River and come in sight of Bianliang (Kaifeng), the capital of the Song empire. Stricken with panic, Huizong abdicated on January 18, 1126, in favor of his son, who became Emperor Qinzong (欽宗). Pigeon on a Peach Branch, by Emperor Huizong. The Jin cavalry had found that overcoming the walls of Kaifeng was a difficult undertaking, and encountered fierce resistance from some Chinese officials who had not despaired like Huizong. As a result, the Jin raised the siege of Kaifeng and returned north, after forcing the Song empire to sign a humiliating treaty which required the payment of a colossal war indemnity and the giving of tribute to Jin every year. Even the acceptance of such humiliating terms could not save the Song empire. Within a matter of months, the Jin came south again, and this time they were determined to overcome the walls of Kaifeng. After a bitter siege, the Jin eventually entered Kaifeng on January 9, 1127, and many days of looting, rapes, and massacre followed. Huizong, his son, Emperor Qinzong, as well as the entire imperial court and harem were captured by the Jin in the Jingkang Incident. One of the sons of Huizong managed to escape to Southern China where, after many years of struggle, he established the Southern Song Dynasty, of which he was the first emperor, Emperor Gaozong (高宗). Huizong and Qinzong were demoted to the rank of commoners by the Jin on March 20, 1127. Then, on May 10, 1127, Huizong was deported to northern Manchuria, where he spent the last eight years of his life as a captive in the small city of Wuguo (in present-day Yilan County, Heilongjiang Province). He spent his last days clad only in a goatskin, huddled in a tiny cellar, unable to eat as his son, Zhao Heng, looked on hopelessly. In the delirium of his dying hours, Emperor Huizong fancied he saw flames firing a kiln of fine porcelain, a satisfying and familiar sight; at that moment, his desire was not fine porcelain, but the warmth of the flames that fired it. He died June 4, 1135, at the age of fifty-two. His temple name means "Honorary Ancestor." In 1135, the northern part of the Song Empire was occupied by Jin armies. Song Huizong's "Ting Qin Tu" (Chinese: 聽琴圖, literally, "Listening to the Qin"
Chinese historians have always been ambivalent about Emperor Huizong. As a ruler he was incompetent, and allowed his advisers to make decisions which hastened the demise of his empire, but his artistic talents and achievements were unparalleled. Huizong was famed for his promotion of Taoism, and was one of the three Chinese emperors to prohibit Buddhism. He was also a skilled poet, painter, calligrapher, and musician. He sponsored numerous artists at his court, and the catalog of his imperial painting collection lists over 6,000 known paintings. Huizong was a great painter, poet, and calligrapher. He also played the guqin (as exemplified by his famous painting 聽琴圖, Listening to the Qin); in his palace, he had a Wanqin Tang 『萬琴堂』 ("10,000 Qin Hall"). The primary subjects of his paintings are birds and flowers. Among his works is, Five-Colored Parakeet on Blossoming Apricot Tree. He also recopied Zhang Xuan's painting, Court Ladies Preparing Newly-Woven Silk, and Emperor Huizong's reproduction is the only copy of that painting that survives today. His painting, Peaches, Bamboo, and Oriole, sold for RMB 61.16 million (US$ 7.33 million) at the China Guardian 2005 Spring Auction. He invented the "Slender Gold" (瘦金體) style of calligraphy. The name "Slender Gold" came from the fact that Huizong's writing resembled gold filament, twisted and turned. His era name of Xuanhe is also used to describe a style of mounting paintings in scroll format. In this style, black borders are added between some of the silk planes. In 1114, following a request from Emperor Yejong of the Korean court of Goryeo, Huizong sent to the palace in the Goryeo capital at Gaeseong a set of musical instruments to be used for royal banquet music. Two years later, in 1116, he sent another, even larger gift of musical instruments (numbering 428 in total) to the Korean court, this time yayue instruments, beginning that nation's tradition of aak. Huizong was a great tea enthusiast. He himself wrote the famous, Treatise on Tea, the most detailed and masterful description of the Song dynasty sophisticated style of tea ceremony. He was also an expert on bronze ware, and oddly shaped stones. No other Chinese ruler had ever devoted so much time to ceramics. Emperor Huizong personally supervised porcelain production at the Guan, Ru and Jun kilns, three of the Song Dynasty’s five most famous kilns (the other two are the Ge and Ding kilns.) Porcelain was produced by the Ru kiln between 1086 and 1106, exclusively for imperial use. It was produced on a small scale by a small number of artisans, and there are believed to be just sixty pieces of Ru porcelain extant. Of all ancient Chinese ceramics, those made in the Ru kilns are the most precious, mainly because they are so rare. A mere fragment of Ru kiln porcelain sells for RMB 1,000 (about US$ 122). Emperor Huizong personally oversaw the selection of craftsmen and materials involved in porcelain production. He emphasized aesthetics rather than practicality; Ru kiln ceramics were small and exquisitely fashioned, seldom exceeding 20 centimeters in height, and were stationery or purely decorative items, such as brush washers, incense burners, and vases. Emperor Huizong was the first to produce porcelain whose shape imitated bronze. Ru Kilns stopped production after the Jin invasion; the artisans fled to the south, but were unable to reproduce the same results using different materials in a different climate. Pottery from the Jun kiln also caught the attention of Emperor Huizong, and was designated solely for imperial use, after which its techniques became highly advanced. The most prominent characteristic of Jun porcelain was its flambé blue-green and purple-red glaze that, in the process of firing, produced unexpected changes in color and pattern. No matter how many vessels were fired in the same kiln, each piece was unique. The origins of China’s crackled glaze porcelains are attributed to the reign of Emperor Huizong. An accident during the firing of a Jun kiln caused it to remain closed until the kiln had cooled down. When the artisans opened the kiln, they heard cracking sounds and expected to find all the pottery broken. Instead, the pieces were intact, and the glaze surface was full of cracks but smooth to the touch, producing a pleasing ring when tapped. Emperor Huizong was delighted with this new feature and ordered more in the same style. Song Dynasty Guan kilns were located near the imperial palace and managed directly by the imperial court. In his later years, Emperor Huizong became a devotee of Taoism and developed a preference for hazy shades of gray, shunning intricate patterns in bright colors. He favored elegance and simplicity, to signify his transcendence of worldliness and attainment of enlightenment. Under his personal instructions, Guan kiln artisans paid great attention to color and achieved a distinctive degree of glaze density. ↑ China Today, Imperial Kilns of the Song Dynasty. Retrieved December 10, 2007. ↑ The Metropolitan Museum of Art, China, 500–1000 C.E. Retrieved December 16, 2007. ↑ Kieth Howard, Korean Music. Retrieved December 16, 2007. Ebrey, Patricia Buckley. 1999. The Cambridge Illustrated History of China. Cambridge: Cambridge University Press. ISBN 0-521-66991-X. Ebrey, Patricia Buckley, Anne Walthall, and James B. Palais. 2006. East Asia a Cultural, Social, and Political History. Boston: Houghton Mifflin. ISBN 0618133844. Ebrey, Patricia Buckley, and Maggie Bickford. 2006. Emperor Huizong and Late Northern Song China the Politics of Culture and the Culture of Politics. Cambridge, Mass: Harvard University Asia Center. Li, Tang. 1964. Song Huizong. Xianggang: Xianggang hong ye shu ju. Little, Stephen, and Shawn Eichman. 2000. Taoism and the Arts of China. Chicago: Art Institute of Chicago. ISBN 0520227840. History of "Emperor Huizong of Song"
This page was last modified on 22 May 2008, at 16:41.